It is really cute clip! It can be used instead of button or buckle,better than it.Very well made and they adds a touch of elegance to an otherwise plain sweater. It is a well constructed easy to use accessory. It is versatile for dressing up or for casual wear. It's a lovely timeless piece of decoration for your clothes! This clip is easy to use and fastens securely. Good wardrobe accessory. The Clips made to hold a shirt, dress or jacket in at the waist at the back. Package:1pcs clip in a cute gift box.Good gift idea for women and girls,lady,mother,wife,girlfriend,daughter,sister,family and friends. Note: The fabric of the clip is not elastic. 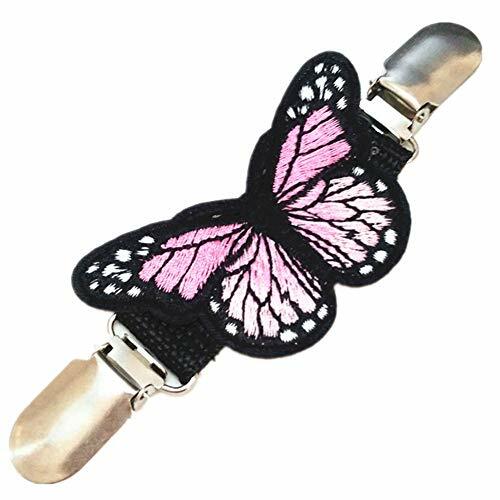 LOVELY design: the clip has beautiful stitchwork butterfly on it, very cute and stylish. Protective:The end of each clip is 2pieces suspender type clips,they are strong to hold securely of the clothes,they have plastic inside to protect the clothes,the Size: 5.3''*1.6''. Versatile:the colorful clip can use for collar,scarf,vest,lightweight coat,jacket,capes, shawl clip pin.It also can use for children winter gloves and mittens clips,prevent from losing the mittens. The butterfly clip guard works to help tighten big clothing, it can be worn on the front or back of your costume,it is practical. Fashion and functional,for sweaters that have no buttons hooks,also cinch for back of dress,top,pants and other big garment. If you have any questions about this product by Ever Cute, contact us by completing and submitting the form below. If you are looking for a specif part number, please include it with your message.